Today, we reached the destination we have been walking towards for 24 days. It’s extremely exciting to reach our goal, but sad for our journey to be coming to an end. As bittersweet as it gets. We woke up at the crack of dawn to start the trek to Santiago. We left our hostel the earliest we ever have. The first hour or two of hiking was extremely bizarre. The sun had yet to rise, so our headlamps provided a tunnel of light so that we didn’t walk into any other hikers or trees. It felt like we were in a race. Mom and I got caught up in a group of Chinese pilgrims who were literally elbowing us out of the way. One of their own fell behind and they didn’t even turn their heads and risk slowing their pace. We were two happy hikers in a swarm of anxious pilgrims. When the sun came up, Mom and I met a sweet young girl and her Mom. The two of them had also hiked the entire Camino together. We talked almost the whole hike to Santiago about our experiences hiking as mother-daughter (Mom and I take pride in the fact that we stopped for breakfast and still caught up with them before Santiago). Interestingly, the two of them didn’t always hike together and were frequently separated by 10-20 minutes. Mom and I couldn’t imagine being more than five feet apart. I am so grateful that we have a relationship that can withstand so much quality time together. As we walked through the suburbs of Santiago, we briefly got lost one last time, but handled it like true seasoned hikers. Santiago is amazing. It is an incredibly beautiful and historic city. 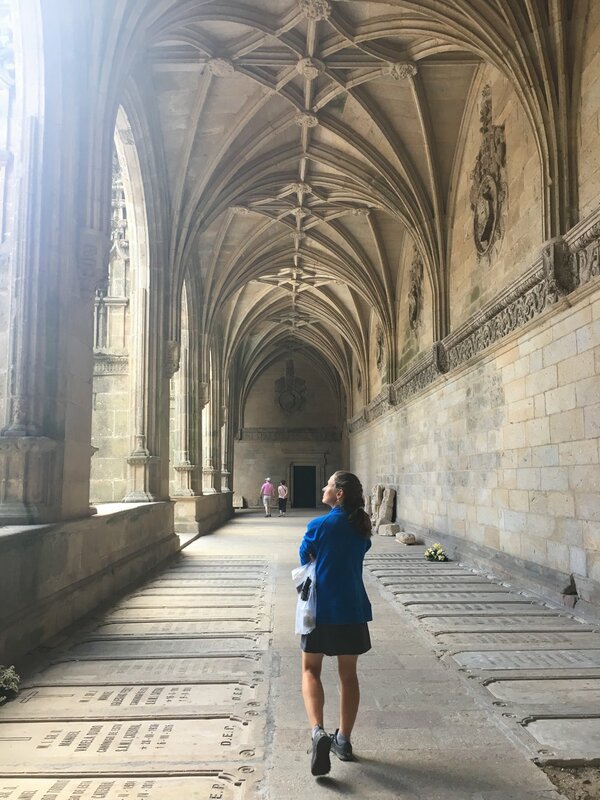 As we walked toward the cathedral under original stone arches, bagpipes played loudly and it felt as if we were personally being welcomed and congratulated on our journey to Santiago. It was unfortunate that the cathedral was undergoing massive construction. We couldn’t fully appreciate the magnificence of its details, but were surely able to feel the impressiveness of the cathedral. After wandering around the plaza a while, we realized that mass would start in only 10 minutes. When we finally found someone that could give us directions into the cathedral (the cathedral takes up an entire block and has many entrances, only one of which was for mass). However, no backpacks are allowed in the cathedral for obvious safety reasons. Thankfully, we spotted a store that held our bags for a few euros during mass and we made it into the service. The cathedral was packed with hundreds of people. It was pretty amazing to see so many people come from far and wide to attend mass here. At the end of the service, a group of six people worked together to swing an enormous botafumerio (a giant incense-burner) from one end of the church to the other. It was an extremely special event that happens only rarely. The church filled with smoke and the sweet aroma of Frankincense as it soared. It was an unforgettable moment. Our last day on the trail was filled with mixed emotions. I was excited to get to Santiago but not because I was excited to be done. In fact, I didn't want to stop walking! We started the morning in the dark with a hundred other hikers and it looked like a scene from the walking dead but moving at a faster pace. We all arrived in Santiago by 10:30 and I felt conflicted when I got there. The cathedral was covered in scaffolding and tarps so that was a little anticlimactic but also this confused feeling like what now? Fortunately Hannah had booked another fabulous little hotel that was a perfect segway into our non hiking life. I felt better after we ate, I usually do, and we had a plan. A beautiful city, an incredible journey with Hannah and memories to last a lifetime or until the next Camino! !